The comic series! 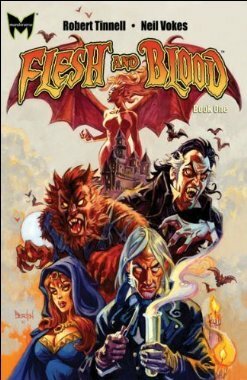 Flesh and Blood the comic series, not actual flesh and blood. I’m not a disturbed creeper. Anyway! I stumbled across this seemingly awesome graphic novel, but alas, I don’t have the cash to get it (stupid bills, stupid adulthood). So instead of having the pleasure of reading this comic, I shall write about it instead. It sounds SO rad! I want it! Have any of you read this comic? If so, what did you think?